Title text: No horse has yet managed the elusive Quadruple Crown—winning the Kentucky Derby, the Preakness, the Belmont Stakes, and the Missouri Horse Hole. There's a lot of animal abuse in there. But is was still funny . I'm also curious about what consequence archery would be. Are you firing at satellites? Or from a satellite? Snake Shaming made me chuckle; but on reflection it sounds more like some Judeo-Christian ritual than a sport. The leglessness of serpents is itself supposed to be a case of divine snake shaming, isn't it? This comic really stumped me. WTF? I'm pretty much emoji-blind (eighty percent of them look alike to me). But I'd still like to see how you'd render my favorite made-up sport: cross-country bowling. da Doctah wrote: I'm pretty much emoji-blind (eighty percent of them look alike to me). But I'd still like to see how you'd render my favorite made-up sport: cross-country bowling. (Angry Face) (National Flag of choice) (Bowl of rice/steaming soup/whatever, as prefered)? -The first recorded game of Hell Escape was written in 1320.
orthogon wrote: Snake Shaming made me chuckle; but on reflection it sounds more like some Judeo-Christian ritual than a sport. Practiced by some small groups of Pentecostals. I wonder if "Snake shaming" is deliberately reminiscent of the Gadsden flag? Randall trolling Trumpistas again? moody7277 wrote: -The first recorded game of Hell Escape was written in 1320. Orpheus and Persephone would like a word. Of course, they were playing under an old ruleset, so purists may choose to disregard their games. "Hell Escape" sounds like sounds like escape rooms as done by the organizers of Spartan races. Or vice-versa. The title text seems a bit odd. While plenty of breeders will immediately retire a horse to stud after winning a Kentucky Derby (the recent triple crown winner had already sold stud rights, so the owner had no reason to retire the horse early), you still should put Missouri Horse Hole before the Belmont. wumpus wrote: The title text seems a bit odd. While plenty of breeders will immediately retire a horse to stud after winning a Kentucky Derby (the recent triple crown winner had already sold stud rights, so the owner had no reason to retire the horse early), you still should put Missouri Horse Hole before the Belmont. From the look of the emojis, I don't think any horse could be expected to race again after competing in the Missouri Horse Hole. Or even be retired to stud, for that matter. PinkShinyRose wrote: I'm also curious about what consequence archery would be. Are you firing at satellites? Or from a satellite? I interpreted Consequence Archery as something like "failure to perform will result in consequences, which may include orbital death ray satellites". Similarly, Consequence Golf. I like this style of comic, where the humor comes from the unexpected juxtapositions and the images they create. This is one of the best ones since keyboard->leopard and force->horse. Personally I feel that Alpine bowling packs more entertainment into my limited time. The Chinese have a great hybrid bowling alley but it is hard to find a time slot to play thanks to all the tourists and the fact there is only one lane available. Candle eating looks like it could be a real emoji for fancy dinner for two. Horse Hole sounds a lot like Polo to me. I read the Consequence Archery as archery on a space station, so the consequence if you miss is that you'll die from decompression (I think the emojis are astronaut-bow&arrow-satellite), and the Consequence Golf one as golfing with a bomb, so the consequence of a miss or a short drive is being blown up. Yeah, that's more likely to be what RM was going for. 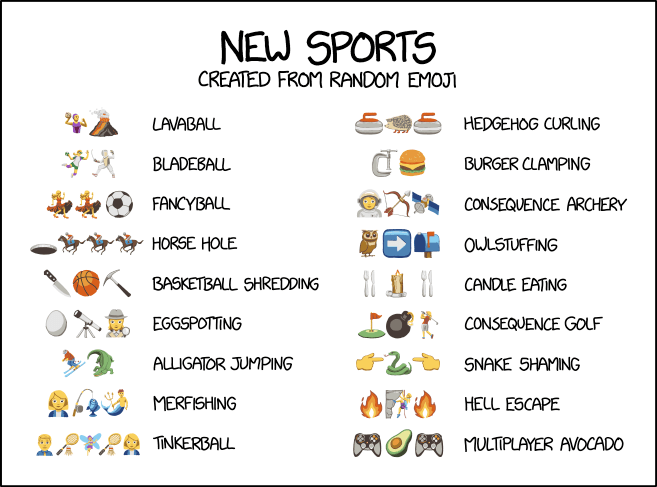 Re: 1920: "Emoji Sports are a mistake (as are emoji"
I don't believe these emoji are truly random, and challenge coders to produce a random emoji chooser. Eternal Density wrote: I don't believe these emoji are truly random, and challenge coders to produce a random emoji chooser. Hmm, book sailing, or recycling families... I think the latter is the most extreme sport.